Most observers of the Amelia Earhart saga are well aware of the longstanding speculation that a plane change gone wrong during one of Amelia’s many stops along the route of her 1937 world-flight attempt might have contributed to the fliers’ doom, or in some way unlocks some key aspect of the so-called “Earhart Mystery.” If only we could locate at least one of these planes, the thinking goes, the rest of the puzzle might just fall into place. The scenarios range from the sublime to the ridiculous, and I won’t include examples of the latter that can be found in a few of the books that exemplify Fred Goerner’s “lunatic fringe” in this post. Among the serious, well-researched theories, we have Paul Rafford Jr.’s “The Case for the Earhart Miami Plane Change,” posted here on Nov. 14, 2014, and Dec. 5, 2016, and I’ve continued to wonder about the possibilities inherent in David Billings’ still viable New Britain theory. Please understand that I’m not taking a pro or con position relative to whether Amelia might have changed planes at some point during her world flight. I simply don’t know, and so I present the ideas of researchers with definite, more finely honed and better-educated opinions. We’ve already seen the ideas of Paul Rafford Jr., who strongly believed a plane change happened in Miami. Next, we’ll examine the evidence presented by Bill Prymak, who strongly disagreed with Rafford. One of them was wrong, of course. The following is the first of two provocative pieces that appeared in Bill Prymak’s Amelia Earhart Society Newsletters, this in the November 1998 edition. DID AMELIA REALLY CHANGE AIRPLANES? Aluminum aircraft skin production in the mid 1930s was a new, burgeoning science, and the process produced various different tones and shades, even from sheet-to-sheet off the same lot. So, each tone or shade becomes a unique signature, and if we study the rear half of the left vertical rudder below the horizontal stabilizer as illustrated on the blow-up below you will find that the same dark shade consistently repeats itself on every photo I have ever seen as the plane wends its way around the world. I have only included in this NEWSLETTER five photos showing this unique signature, and I would certainly like to expand my file on this issue. If anybody out there has a photo of AE’s airplane with the above signature clearly shown, please send a clear copy to me, it’ll be deeply appreciated. In the March 2000 edition of the AES Newsletters, we find a more extensive photo essay by Bill Prymak, with plenty of information that was lacking in his first piece. Thus, a few photos are repeated to avoid confusion. HOW MANY DIFFERENT AIRPLANES DID SHE REALLY FLY? The feeding frenzy continues to this day . . . rumors, stories, swear-accounts, and “positive documentation” that Earhart flew more than one airplane on her final flight. Some of the “documentation” pointing to multiple airplanes is pretty darned good, suggesting government involvement with cloak-and-dagger overtones, spy missions, a second Electra 10 being shipped to Australia, all making great reading for the conspiracy-hungry American public, but sadly, the true-grit hard copy proof still remains elusive. This analysis is presented after searching through Lockheed Documents, Purdue Library SPECIAL COLLECTIONS papers, and CAA documents, which together give an accurate and objective perspective of the events of May 1936 thru July 2nd 1937 re: the acquisition and registration of her airplane, plus an in-depth study of the timing and implantation of the various modifications, alterations and additions done to her ship during the above period. The author bears no pre-conceived opinion re: the multi-plane theory. Let the chips (and the facts), fall as they may. May 16, 1936: George Putnam telegraphs Bob Gross, President of the LOCKHEED CORPORATION, directing him to proceed with the construction of Amelia’s LOCKHEED ELECTRA 10E, but, for confidentiality reasons, GP orders Gross to temporarily name CLARA LIVINGSTON as purchaser until the aircraft is delivered to Earhart on July 24 with the assigned registration number of 16020. It’s appropriate at this time to discuss the Lockheed Electra 12A discovered on Mount Tierfort, Bicycle Lake Calif., in 1961 by Joe Gervais, bearing the same registration number, N16020. With the serial number 1243, and delivered 12 May 1937, this airplane acquired a strange twist of fate when it was later purchased by PAUL MANTZ, technical advisor to Earhart on her final flight. In June of 1957 Mantz requested and obtained a change from the aircraft’s existing registration N 60775 to N 16020 (the number on Amelia’s lost aircraft, but lacking the “R”), and the 12A still had that number when it crashed in 1961. 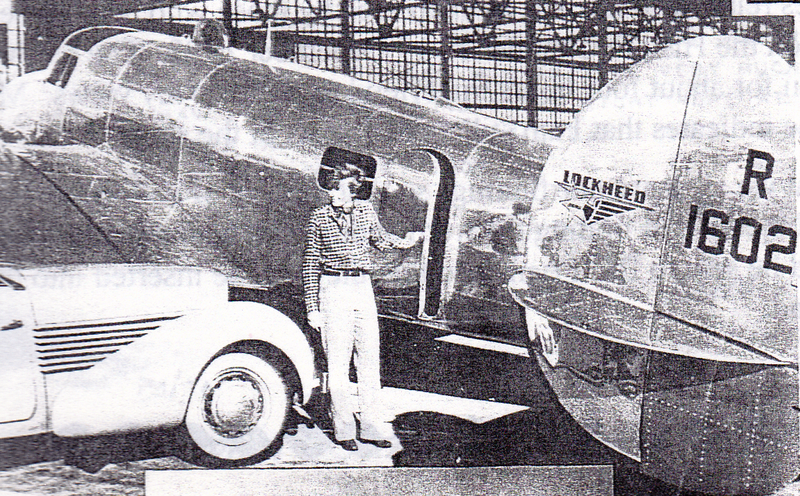 Earhart’s airplane, delivered to her on July 24, 1936, had a single window at each side, but by the end of the year it had been extensively modified with six cabin fuel tanks, four filler ports instead of the original two, and two windows added: one in the entrance door and another opposite in the fuselage for a total of four. These two added windows were larger than normal and were optically flat, for accurate celestial navigational purposes. 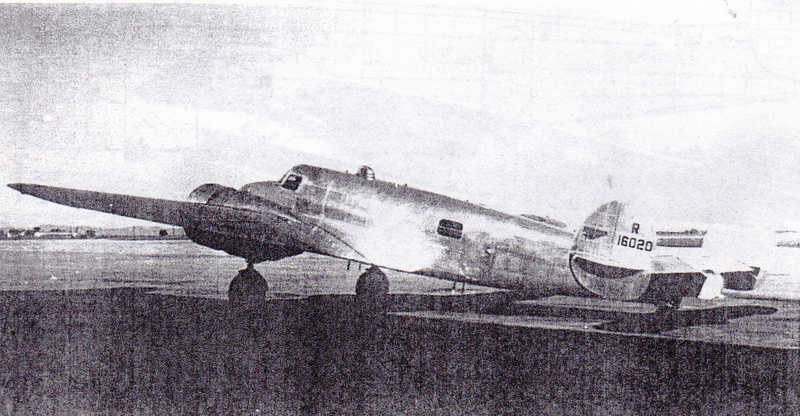 Later, just before her second attempt, the starboard large window was removed and the fuselage skinned over. This appears as a bright shiny patch easily seen on photographs taken at Miami, circa June 1, 1937. The “R” designation, plus the Hooven faired DF housing on top of the fuselage, plus the solid door, plus the shiny new metal all-around, dates this photograph pre-November, 1936. Also note the “light-colored” logo on the right rudder. Further note the horizontal bar in the side window, the purpose of which still baffles researchers. P.S. Note the dark “Prymak” signature, the vertical left bottom rudder rear section that seems to ubiquitously find its way right up to Lae New Guinea. After July 1936, Amelia’s aircraft adorned the registration number of X 16020 as seen in the photo below (“X” designated factory test work). 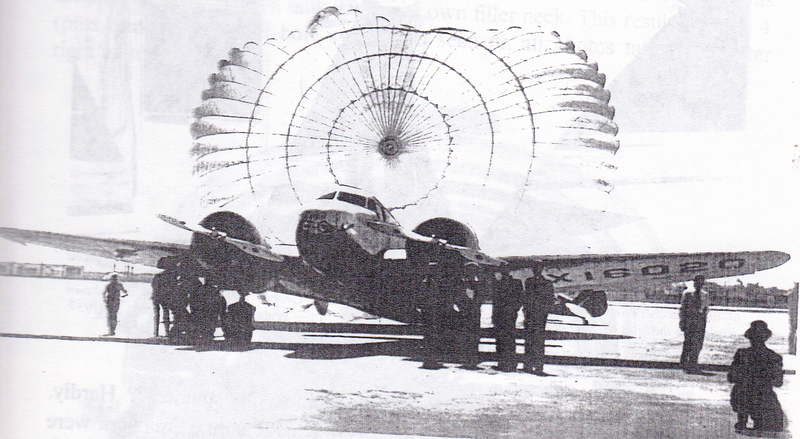 R 16020 was seen on the aircraft when she entered the BENDIX AIR RACE in September 1936, at which time the engine cowlings were painted in a New Zealand motif. The “R” designation was requested Aug. 6 and approved the next day. On Sept. 21, 1936 the Bureau of Air Commerce finally approved NR 16020, but the aircraft continued to display R 16020 well into the end of 1936. 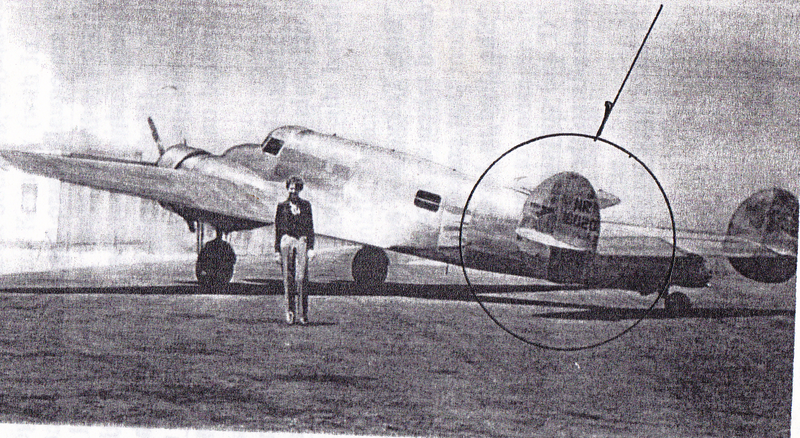 The photo below taken late October 1936 shows the FRED HOOVEN DF dome, solid door, dark-colored logo, bar in window, and bottom protruding wing navigation light. Trailing antenna fairlead is also clearly shown at rear of airplane. 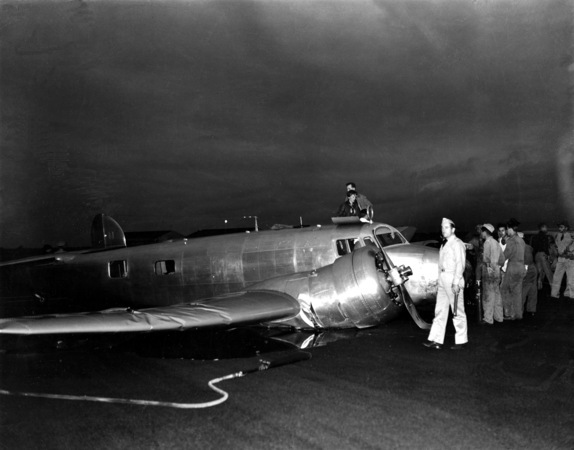 The photo below shows the post-crash mess at Luke Field, Hawaii. Note the door has built-in window. Photo below, arriving back in the states, shows ADF loop, larger rear starboard window, and large dark fuselage panel, just above right wing. This dark panel can also serve as a “signature” for photos in other locations. Photo below shows well-documented Miami June 1 takeoff. Note the shiny new patch over rear window, our side fuselage dark panel over the wing, the dark long skinny panel over the two windows, visible in both photos, and it becomes apparent that both photos show the same airplane. 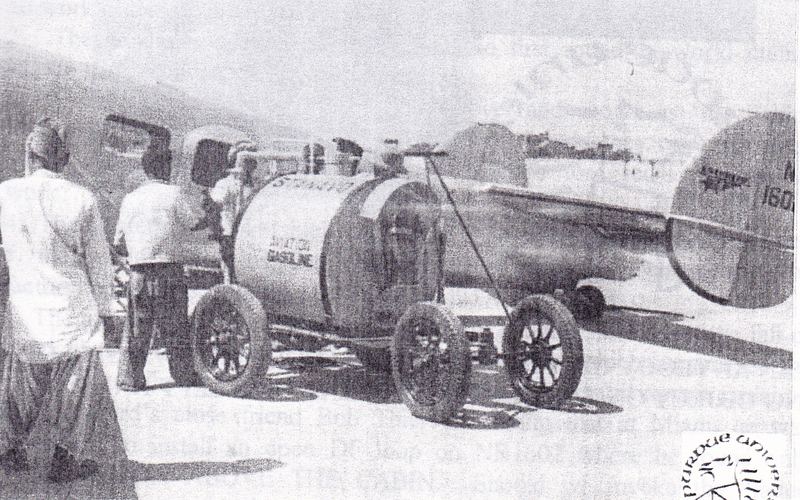 The Electra taxis for take-off on Amelia’s all-fated round-the-world flight Miami, Florida, June 1, 1937. The Lockheed drawing below shows the configuration of the aircraft just before her May 20 departure on the second attempt. As noted on the drawing, the flush navigation lights appear, probably because the new right wing installed after the crash had the flush design already incorporated into the wing, necessitating the left wing to be similarly configured. Note 4+1 filler ports, window in door, and dark logo. And finally, conspiracy buffs get all cranked up over a photo like this, claiming all kinds of sinister things like” positive proof-another airplane,” but this most likely was just another PR stunt (for which AE was famous) with the letter “E” painted or taped on the right side. “E” for what? EXLAX? What can we deduce from the previous photos? 1. 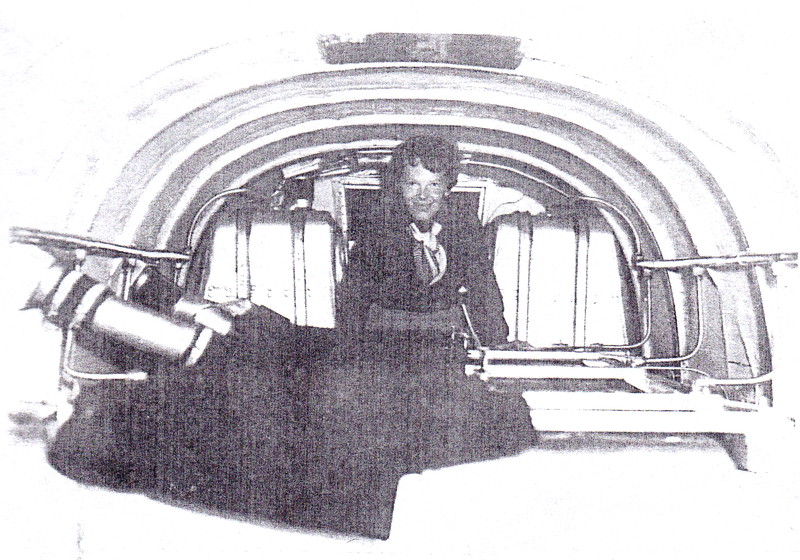 The cabin door was certainly windowed around January 1937. I have found no work orders to confirm actual date of installation. 2. The bar in the window vanishes before the first round-the-world-attempt March 15 — clothes rack for Fred? 3. Right side second large window [was] skinned over and shown as “new, shiny aluminum” before AE left for Miami. But why would they cover an oversized window fitted with optically perfect glass for Fred’s navigational work? 4. The mystery of the 4+1 fuel ports pretty well explained on previous pages. 5. The navigation lights were installed when the new right wing was installed during the factory repair days, March 30 to May 20, 1937. Your comments are of course welcomed. I agree with *Mike, that there was no plane change. As he points out, it’s more than obvious, it’s the same plane. I thought the reason behind, this around the world flight, was to prove that a single plane, could be flown around the world. For them to have switched to another plane, half way or three quarters through this journey, would have contradicted the whole reason for doing so. I can certainly see, adjustments to the aircraft, with the weight, fueling and antenna receptions, but not with an entirely identical aircraft. Frankly, I think the whole idea of switching Electras in Miami or anywhere else is a blind alley and a huge distraction. The first questions in my mind are “Why?” and “To what purpose?” So far, I’ve seen no plausible reason to switch aircraft; only unsupported speculation. Additionally, the logistics of secretly switching Electras and keeping it all quiet would be a risky and very difficult if not impossible task requiring perfect timing and coordination to execute. It violates the rule of simplicity. If a switch of aircraft was to be made at all, the time and place to do it was during the post-accident repair and rebuild at Lockheed in Burbank. And, even in that controlled environment with limited access, it still would have required much careful planning and attention to detail — especially as it pertains to the extensive paper trail of aircraft maintenance and repair logs, parts and sub-component inventories, etc. — to keep things quiet and not arouse undue curiosity and suspicions. I was not aware that such a thorough investigation had been done by Prymak. It certainly proves that she had the same plane all the way to Lae, and there is no way I can think of she could have changed planes after that. The plane might have had some improvements after the crash, but it certainly doesn’t look like they could have given her a whole new plane as Randall Brink asserts. I noticed today on Facebook that there is or was a group looking for her plane in New Britain, couldn’t find any further info on that. That might be something David Billings started. At the best he might find that the engine with C/N 1055 tagged onto it was taken from her original plane and installed on another 10E or the whole thing is a hoax, although I don’t know what purpose that would serve. I give up on the plane switch theory. I read “THE CASE FOR THE AMELIA EARHART MIAMI PLANE CHANGE” by Paul Rafford; he says Bob Thibert was told to install a new radio loop the morning before her departure (May 31? ), yet AE arrived in Miami with a DF Loop already installed. I came across an AP article entitled “Earhart at Miami On Test Flight of Rebuilt Airplane” (Miami, May 23,1937) and the last paragraph states “Pan-American Airways loaned her two technicians to install in her plane a radio direction finder similar to those used by the airline on its ships in South American and Pacific flights”. I know the “Daily Express” didn’t have a loop installed. Something seems to be off with regard to the DF. Thanks Tom. Your find tends to support Paul Rafford’s belief, and the Miami DF installation becomes more of a substantiated incident. Photos of the Electra during the flight show the same Bendix DF loop. So what are we to think? It sounds to me like the DF loop antenna installed by Paul Mantz was replaced with yet another by the PAA technicians in Miami. And, to what purpose? Very confusing! Is there a link to the 23 May 1937 AP article? I’d sure like read it. AE arrived in Miami on May 23rd, and the Daily Express on May 24th; Paul Rafford wrote “The two airplanes were secretly swapped and the Daily Express was turned over to Pan Am’s mechanics. 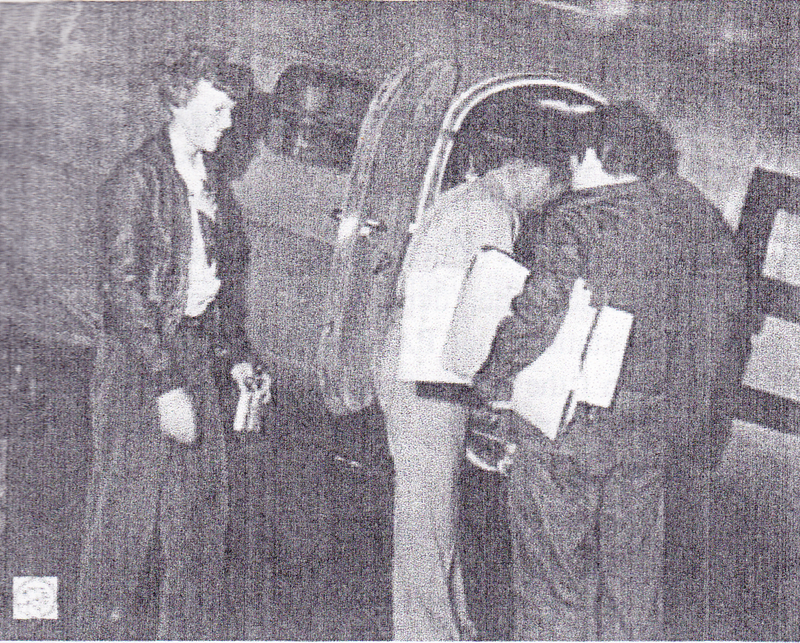 They then prepared it for the world flight, never suspecting they were not working on Earhart’s original Electra”. The trailing antenna was removed from AE’s plane and Rafford said “Although Earhart could dispense with the trailing antenna, she did need a loop and a more efficient fixed antenna. This is where Pan Am came into the picture. Radio mechanic Lynn Michaelfeller would lengthen the fixed antenna and Bob Thiebert would install a loop”. At this point then (per Rafford), there were 2 Pan Am mechanics working on the Daily Express. As Mike pointed out, the article tends to support Paul Rafford’s belief. I think the article implies the installation was done soon after arrival, but Bob Thiebert said he installed the new loop on May 31st, so there’s that also. In 1992 Rafford asked Bob Thiebert “during the installation had he seen any evidence of where previous loops might have been mounted? He said, “No,” and was quite surprised when I told him that at one time or another there had been at least two other loops mounted on Earhart’s plane. Bob had found only virgin skin where loops are mounted”. Even if the new loop was mounted on the Daily Express, it seems the other evidence including the aircraft skin “signatures” still shows AE flew the original to (and took off from) Lae. As far as the Daily Express is concerned, who knows? I found the article on newspapers.com (it was carried by the Tampa Tribune on May 24,1937). I was unable to find a way to provide a link (I have a subscription). Many thanks for the information about the newspaper article. It’s much appreciated. The whole scenario of multiple changes of DF loop antennas, possibly switched out Electras, differing fuselage windows and varying shades of aluminum skin is mind boggling. Who knows, indeed? My take is that AE and FN took off from Miami in the original Electra, Serial #1055 and flew it all the way to Barre Island, Mili Atoll. I was going to give up on this subject, I thought, what difference would it make if she did switch planes? Even if she flew a souped-up L12 as Brink claims (which seems impossible) then, so what? 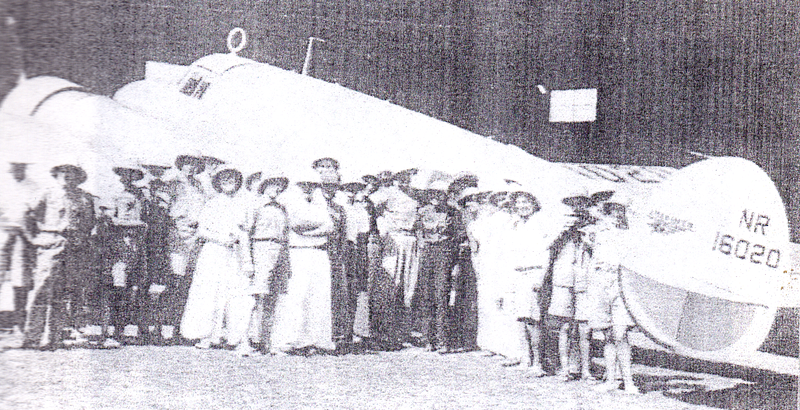 Her original plane seemed perfectly capable of flying to Howland or Mili. I should re-read TTAL to see why Devine was certain it was her plane at Aslito field and I don’t remember exactly the story about someone stealing a slip of paper out of his pants pocket. Does this have something to do with her apparently being on some kind of a spy mission? There is not enough info available to me to even speculate. But the reason I write today is that I was reading this week’s story from Ric Gillespie that for some reason pop up on my Google News on my phone. Google must have some kind of system where they spy on everyone and when they find an interest in AE they send out these press releases to confuse their presumably simpleton readers about AE. Kind of creepy. So anyway, Ric says he has come across some old forgotten movie film of her appearance and take-off at Lae. This will presumably prove in some way the existence of an aluminum patch on her plane which turned up on Gardner Island. I thought this idea was long disproved. So there are some tiny pictures on my phone which supposedly show the patch on the right side of her plane, but he is awaiting the restoration of the brittle old film so I don’t know where the pictures shown came from. It would be interesting if he does find pictures at Lae showing the right side of her plane and the signature section of aluminum in the middle of the plane does not show up. The suspense is killing me. He says instruments from her plane were found at Aslito Field in 1991 or in the nineties? I never heard that. Is that true? One of the comments states that the Japanese didn’t use Truk as a military base until 1939? Is that wrong? Why then would she fly over it in 1937? Then I thought, (never mind the Akagi and the Zeros) what if it dawned on the Japs that she had just flown over their secret base on Truk and they sent some fighter planes in pursuit. Could they have possibly forced her to fly to the Marshalls? Told her over the radio to keep quiet or they would shoot her down? Sounds outlandish, but so does every other explanation. Could the radio reports from the Itasca have been completely falsified? I guess anything is possible. Just saying. Nothing from her plane was found at Aslito Field, period, end of story. Japan took control of Micronesia from 1914 and under a veil of secrecy developed the region to its liking. Following on with its war with China which began in 1931, Japan initiated a war with the USA in the Pacific and as part of this war, they established major bases in Micronesia, one of them being Truk Lagoon. It became the Imperial Japanese Navy’s Fourth Fleet base from November 1939 and the Combined Japanese Navy Fleet were based there from July 1942 to February 1944. Truk Lagoon was regarded by the USA during World War II as the strongest naval base in the Pacific with the exception of Pearl Harbor. Over 37,000 Japanese lived and worked in Truk Lagoon, dominating the 9,000 Chuukese until the end of the war in September 1945. The veil of secrecy that Japan surrounded the whole of Micronesia helped fuel American suspicion on whether Japan was establishing military bases in the region. The speed with which Japan struck Pearl Harbor and then captured bases such as Guam, the Philippines and Rabaul was facilitated by the ships and aircraft based in Micronesia and at Truk Lagoon. Five airstrips and seaplane bases were built in Truk Lagoon, some initially as civilian facilities, and they were quickly converted to military use. As the war progressed, only minimal repair facilities, fortifications and defences were established and when the Japanese Army arrived en masse in January 1944, they considered the base was poorly equipped to defend itself. The army established numerous coastal defence and anti-aircraft guns, pillboxes, bunkers, and caves in preparation for an amphibious invasion but this was of little use against the 18 month period aerial bombardment which began in February 1944. Truk Lagoon was also greatly hampered by American submarines which reduced the number of ships, equipment and personnel getting to and from the base. They sunk over 1000 large merchant vessels and about 300 Navy vessels during World War II. It didn’t happen overnight. Truk was berthing plenty of warships in 1937, you can bet on that, and we didn’t have much good intel on everything going on there. Did anyone ever wonder if maybe, for some reason unknown as yet, by AE “disobeying orders”, the “powers that be” felt they had the right to stop the whole thing at the last minute. What if the fliers were shot at and it hit the left wing, she managed to land it anyway yet nobody showed up for a week. Why a week. If Japs did it, they would have been right there picking them up. The Marshalls were building up their war industry in 1937. Posturing was already in progress in this area. There was a rogue group of Kempeitai and Navy officers already there, picking up stragglers. Also an active CIA training facility. Much earlier than anyone thinks. Not sure what you’re getting at. First of all the CIA (https://en.wikipedia.org/wiki/Central_Intelligence_Agency) wasn’t created until September 1947. Please provide a source for this “CIA training facility” in 1937. If the Japs didn’t shoot the flyers down, who did? Please be clear and say what you mean. The Office of Strategic Services (OSS) was formed in 1942, dissolved in 1945. Before OSS it was the Coordinator of Information, an intelligence and propaganda agency of the United States Government, founded on July 11, 1941, by President Franklin D. Roosevelt, prior to U.S. involvement in the Second World War. Before Coordinator of Information, I know of no national agency for this function. So who was running this “training facility” in 1937? Was it the Office of Naval Intelligence (ONI), the infamous author of the 1960 ONI Report, which I have written so much about? ONI was formed in 1882, but where is any evidence they were running a spy school in the Marshalls? So we have our agencies and terms straight now, but that’s about all. Doesn’t it seem odd that nobody arrived to pick them up til a week later and it wasn’t our guys? I don’t know who would have shot them down. Not trying to be vague, just no proof. There was an intelligence or spy training in a rogue outpost on Saipan, with access to American newspapers and information. My old computer seized up a while back and lost a lot of data. Been trying to relocate it and will share with you asap. The Koshu arrived at Jaluit on July 13 and left Jaluit July 19. One researcher believes Koshu never left Jaluit during that time, and did not pick up the fliers. I simply don’t know when Koshu and the fliers were united, or if they ever were. We know Bilimon treated Noonan aboard a ship at Jaluit, and Koshu has always been assumed as the one. Its logs reflected a re-direction from Truk, or possibly Palau, to Saipan, which supports the nighttime unloading of the Electra on Saipan, according to Antonio Diaz’s account to Goerner. I’m not in the mood to look up the page number of The Search for Amelia Earhart at the moment! There was no “spy training in a rogue outpost on Saipan, with access to American newspapers and information” on Saipan in 1937. The Japanese were there and in total control, as only they could be.